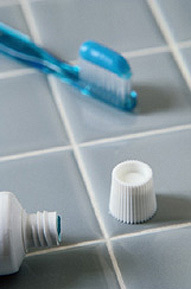 Daily brushing and flossing, and regular professional cleanings, will normally take care of unpleasant breath. Don't forget your often overlooked tongue as a culprit for bad breath. Bacterial plaque and food debris also can accumulate on the back of the tongue. The tongue's surface is extremely rough and bacteria can accumulate easily in the cracks and crevices.